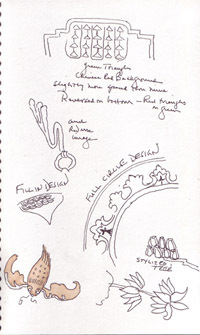 Danny Gregory organized a sketchcrawl at the Rubin Museum of Art in February 2006 and I have several journal pages with some design elements that I sketched from the paintings. I have one drawing of a beautiful stylized fish - that was my favorite image. For some reason the scan looks fuzzy after I changed the size! Last Saturday I saw a very small exhibit at FIT (The Fashion Institute of Technology) in New York City which was entitled The Power of Paint. 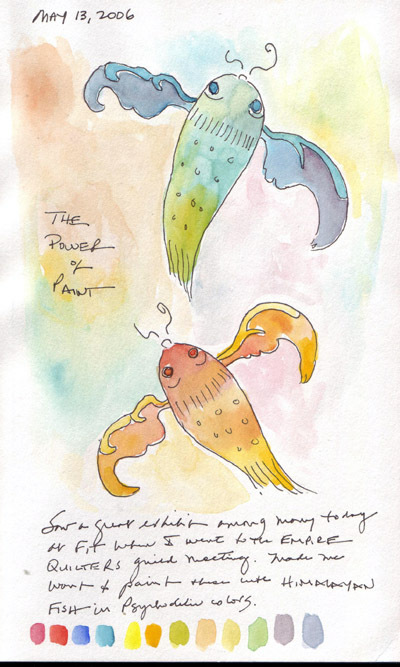 I loved the transformation of all of the images and objects in the exhibit by adding color and wanted to use brighter colors on my fish to remember the transformation that is possible. I was very fortunate and absolutely delighted that I was able to spend Mother's Day with my three children, their spouses, and my 3 grandchildren. My 87 year old mother Margaret lives in Texas so we had a celebratory phone call, but no visit. I decided to honor my maternal lineage for this challenge: my mother Margaret, her mother Bernadine, her mother Margaret, and Margaret's mother Mary. Mary was born in East Flanders in the early 1800s and immigrated to the United States with her parents in 1854 as a young married woman. 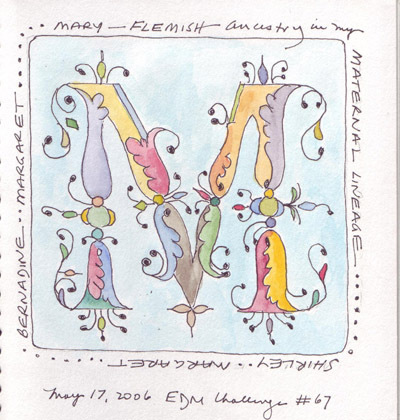 The letter "M" was inspired by a Dover publication entitled Alphabets and Ornaments. 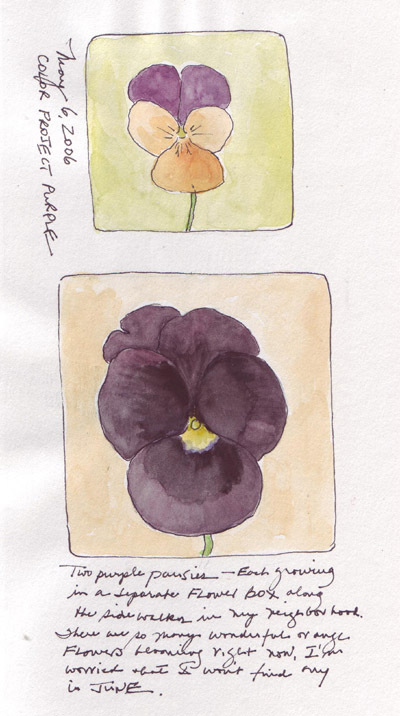 I continue to work on purple this month and have several more paintings done. Click on the image to enlarge the scan. It is definitely harder to mix secondary colors than to just match primary colors to objects sketched. 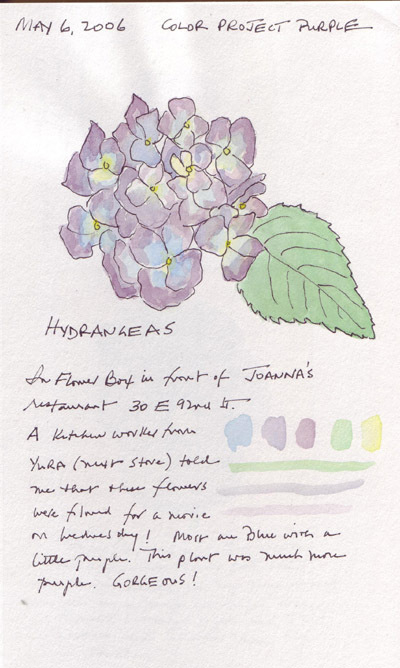 I loved sketching and painting the hydrangea that was growing in a windowbox in front of a neighborhood restaurant. Most of the people arriving for brunch ignored me completely, but one man just said "nice painting" over his shoulder as he passed me and entered the restaurant. 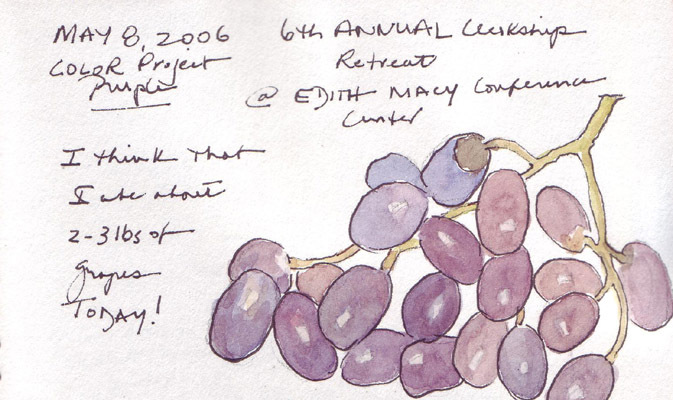 This was great for my confidence of sketching AND painting in public. 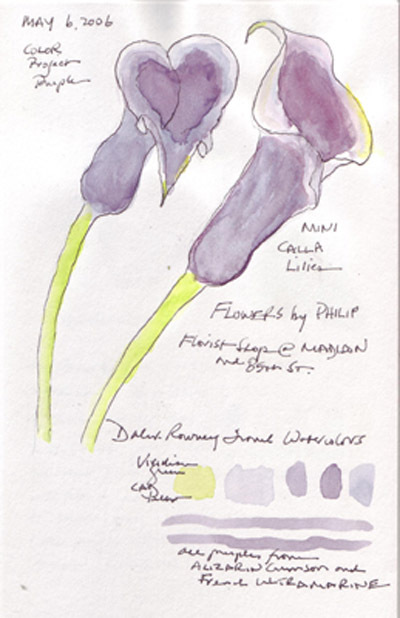 Information on the cool and warm blues and reds that I used are in the first purple entry for the month. 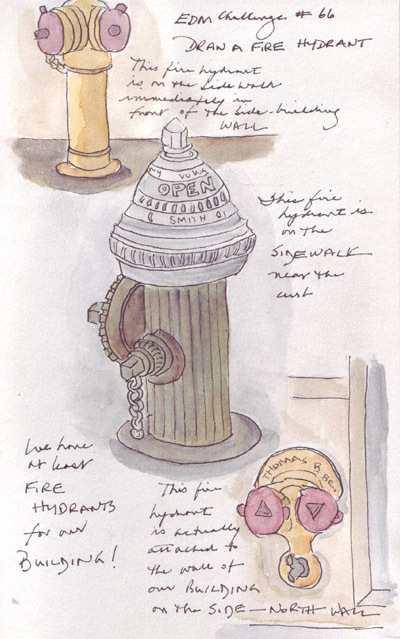 We live in corner building and I was able to sketch/paint 3 fire hydrants just around the corner - along the side of our building. The one on the top left stands on the sidewalk right in front of the building, the big one in the middle is on the sidewalk along the curb, and the one on the bottom right is actually on the wall of the building. Two of them are beautifully polished brass, but I'm still not able to accurately capture reflective surfaces. Maybe next year! 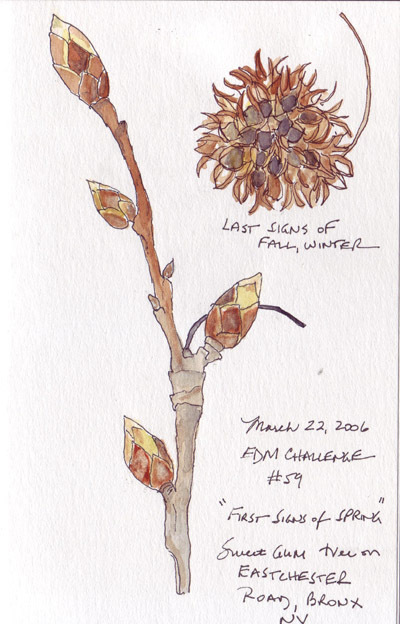 I found a few buds on a sweet gum tree for EDM Challenge #59 and then fell in love with that particular tree! 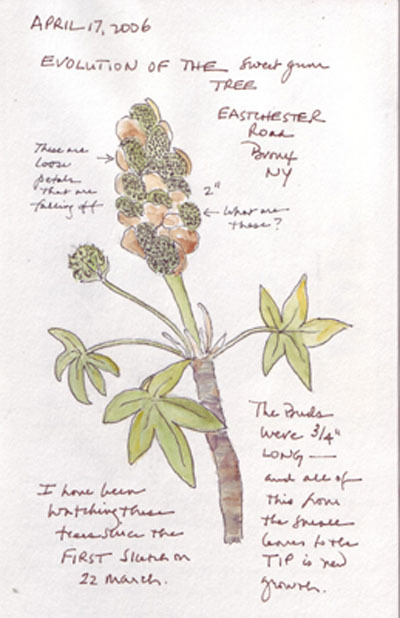 My first sketch was done on March 22nd and the buds were only 3/4 inches long. I walk past a row of these trees when I leave work and each day watched for changes in those very tiny buds. 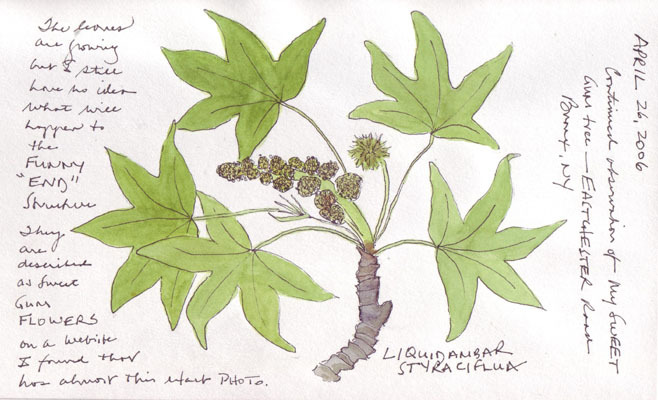 I have painted two more sketches of the tree and now want to post all of these entries together. By April 17th, the tip of the original bud had grown to approximately two inches and several very small leaves and one very tiny seed ball had appeared. By April 26th, the leaves and seedball were slightly larger and the bud was now a fully formed flower. On May 3rd (no sketch), all of the flowers were lying on the ground below the tree and both the leaves and seedballs were growing daily. I love the brown, dried seed balls that fall from these trees during the fall and winter and look forward to watching what happens to the baby seedballs on my tree over the next few months. Several leaves from these trees were collected in the Fall of 2004 as patterns for my autumn-theme, quilted, silk wedding chuppah (#3) which can be seen in the "threads" category on this Blog (http://www.paperandthreads.com/2006/01/post.php). Thanks Karen and the EDM group for Challenge #59 because I'm not sure that I would ever have watched a tree with such passion!